What does successful aging look like? In one of the more influential papers on the subject published in 1987, Rowe and Kahn describe successful aging as involving freedom from disease and disability. This definition has been adapted over time but is still being used today. Take a recent study published in CMAJ defining “successful aging” at 60 years of age or older as satisfying each of following criteria . 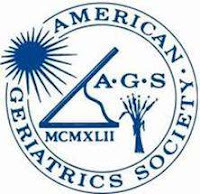 . .
Rafael Romo, Alex Smith, and colleagues recently published a paper that further challenges the notion that “successful aging” is aging without disability. It is better to die dry than wet. At least that is the gist of traditional thinking in hospice and palliative care, where parenteral (IV or subcutaneous) fluids are often avoided at the very end of life to prevent fluid buildup in the lungs and other organs. The problem is that delirium often complicates end of life care as well. It is one of the four most common emergency calls for individuals receiving palliative care in the home and a common reason for admissions into inpatient hospice units. Reduced oral intake, a part of the natural dying process, may result in dehydration in some but not all individuals at the end of life, and may be a factor in the development delirium. Studies in the geriatric literature suggest that early recognition of dehydration and volume repletion is an important component of delirium prevention. So, how do we reconcile our desire to avoid the unintended consequences of IV hydration in those at the end of life with that of treating dehydration to prevent delirium? Some argue for a greater use of parenteral fluids in these patients to improve quality of life, at the very least for those with some evidence of dehydration. However, the question remains, does IV hydration improve quality of life and decrease incidence of delirium, or will it just worsen symptoms at the end of life? Dr. Eduardo Bruera and colleagues from MD Anderson add some evidence to how best to manage fluids at the end of life thanks to a study recently published in the Journal of Clinical Oncology. The authors randomized 129 individuals with advanced cancer from 6 hospices to either parenteral subcutaneous hydration of 1 L per day of normal saline or placebo. 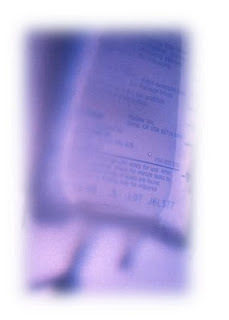 In order to maintain blinding for both patients and staff, the placebo was a 100ml a day of saline injected over a similar 4 hour period per day as the fluids in the intervention group. Inclusion criteria included advanced cancer, reduced oral intake of fluids with evidence of mild or moderate dehydration, at least mild symptoms of fatigue, hallucinations, sedation, and myoclonus, a life expectancy of less than 1 week, , and a Memorial Delirium Assessment Scale (MDAS) score less than 13 (i.e not severe delirium). Those with severe dehydration were excluded as were individuals with renal failure, congestive heart failure, or a history or clinical evidence of bleeding disorders. The authors did find some differences in some measures such as night-time delirium scores, which was worse in the placebo group. However, given the numerous secondary outcomes (47 of them), I wouldn’t place much weight on this, as by pure chance at least two of these outcomes will be positive using a P of 0.05. One big limitation of the study was that it was underpowered. The planned sample size was 150 patients, but funding issues required termination of the study after 129 patients. This was likely due to the strict inclusion and exclusion criteria. So, you can argue that the authors didn’t find a difference because they didn’t enroll enough patients (a Type II error). This may be a classic Type II error where no significant difference between groups are reported when in fact such a difference exists. I would be surprised though if the authors enrolled another 21 patients that a clinically significant result would have materialized for the primary outcome since it didn’t look like a trend was developing (-3.3 vs -2.8, P=0.77). So in the end, we have some data to suggest that IV hydration of 1 liter is unlikely to provide a meaningful benefit to most hospice patients with advanced cancer with mild to moderate dehydration (but not severe). This is a guest post by Dr. Ronald Pies in response to this week’s GeriPal post about the removal of the Bereavement Exclusion from DSM-5. Dr. Pies is the Editor-in-Chief Emeritus of Psychiatric Times, Professor of Psychiatry and Lecturer on Bioethics & Humanities at SUNY Upstate Medical University, and Clinical Professor of Psychiatry at Tufts USM. Though it’s still early after his wife’s death—and some clinicians may want to defer a final diagnosis for another week—all clinicians should be very concerned about Mr. Smith. He easily meets DSM-IV (and now, DSM-5) symptom and duration criteria for MDD. (A previous bout of MDD in his history would strengthen the likelihood, as would several other clinical findings I have omitted). And yet, under the present DSM-IV “rules,” Mr. Smith probably would not be diagnosed with a major depressive illness. He would simply be called “bereaved.” Why? Because he is still within the 2-month period that allows for use of the bereavement exclusion; and because Mr. Smith doesn’t have the DSM-IV features that allow the clinician to “override” use of the BE; namely, severe functional impairment, suicidal ideation, psychosis, morbid preoccupation with worthlessness, or extreme guilt. It’s important to note that the DSM-IV exclusion rules did not apply to any other type of loss, such as losing one’s job or becoming homeless. Ironically, if Mr. Smith’s wife had left him for another man, he would meet MDD criteria, using current DSM-IV rules! Many of us who have specialized in the treatment of mood disorders found the DSM-IV criteria not only illogical, but also inimical to good clinical care. We were concerned that many bereaved patients like Mr. Smith–who meet all symptom and duration criteria for MDD, but who happen to have lost a loved one within the past two months– would be shunted out of the mental health care system. In the view of many (though not all) mood disorder specialists, the risk of overlooking MDD, with its high potential for suicide, far outweighs the less serious risk of “over-calling” MDD—the so-called “false positive” scenario. The elimination of the bereavement exclusion (BE) by the DSM-5 does not mean that “grief is now a mental disorder,” as some have claimed. Nor does it mean that anyone who is grieving within two weeks of a loved one’s death—i.e., most people!—will be diagnosed with major depressive disorder. (Two weeks is the minimum duration required for MDD, under DSM-IV and DSM-5 criteria). First of all, studies have shown that most bereaved persons will not meet full DSM-5 criteria for MDD. 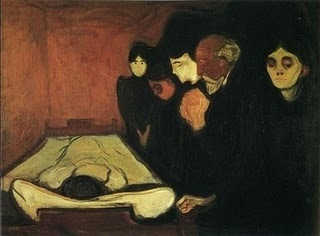 Second: it would be extremely rare, in clinical practice, for a bereaved person to seek psychiatric care within two weeks (or even a month) of the death of a loved one, unless something very unusual or dysfunctional were going on—for example, the bereaved person has developed a psychotic-level disturbance; is severely incapacitated; or has become suicidal–in which cases, the bereavement exclusion would not apply anyway. And, contrary to the strident claims of some, nothing in the diagnosis of MDD will prevent bereaved patients with MDD from receiving the love, support, and solace of family and friends. To be sure, physicians and other health care workers need a much better understanding of the key differences between ordinary grief and major depression. For example, bereaved persons with normal grief often experience a mixture of sadness and more pleasant emotions, as they recall memories of the deceased. Anguish and pain are usually experienced in “waves” or “pangs,” rather than continuously, as is usually true in major depression. The grieving individual typically maintains the hope that things will get better. In contrast, the clinically depressed patient’s mood is almost uniformly one of gloom, despair, and hopelessness–nearly all day, nearly every day. The bereaved individual usually maintains a strong emotional connection with friends and family, and often can be consoled by them. The person suffering a severe major depressive disorder is usually too self-focused and emotionally “cut off” to enjoy the company of others. Indeed, Dr. Kay R. Jamison has pointed out that “The capacity to be consoled is a consequential distinction between grief and depression.” My colleagues and I are now developing a screening questionnaire (the PBPI) based on these distinctions. We don’t yet know the final wording of the DSM-5 text, which we hope will emphasize and clarify the distinctions between ordinary grief and major depression. In conclusion: eliminating the bereavement exclusion means essentially this: the death of a loved one–a common precipitant of major depression—-will no longer be a “disqualifying” factor in diagnosing MDD, within the first few weeks after bereavement. This emphatically does not mean that we should be starting everyone with bereavement-related MDD on antidepressants! Some depressed and bereaved patients will heal and recover with “tincture of time”; some will benefit from cognitive, supportive or grief-oriented psychotherapies. More severely depressed, grieving patients–those, for example, with melancholic features or pronounced suicidality–may require concurrent medication and psychotherapy. No, indeed: we must not “medicalize” normal grief. But neither must we “normalize” major depression, simply because it occurs in the context of bereavement. Pies R. Was the bereavement exclusion originally based on scientific data? World Psychiatry. 2012 Oct;11(3):203. Pies R. Bereavement, complicated grief, and the rationale for diagnosis in psychiatry. Dialogues Clin Neurosci. 2012 Jun;14(2):111-3. Zisook S, Pies R, Corruble E. When is grief a disease? Lancet. 2012 Apr 28;379(9826):1590. Zisook S, Corruble E, Duan N, et al: The bereavement exclusion and DSM-5. Depress Anxiety. 2012 May;29(5):425-43. Lamb K, Pies R, Zisook S. The Bereavement Exclusion for the Diagnosis of Major Depression: To be, or not to be. Psychiatry (Edgmont). 2010 Jul;7(7):19-25. Zisook S, Simon NM, Reynolds CF 3rd, Pies R, Lebowitz B, Young IT, Madowitz J, Shear MK. Bereavement, complicated grief, and DSM, part 2: complicated grief. J Clin Psychiatry. 2010 Aug;71(8):1097-8. Zisook S, Reynolds CF 3rd, Pies R, Simon N, Lebowitz B, Madowitz J, Tal-Young I, Shear MK. 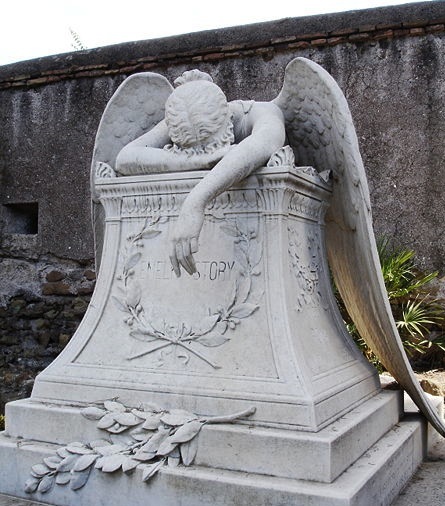 Bereavement, complicated grief, and DSM, part 1: depression. J Clin Psychiatry. 2010 Jul;71(7):955-6. Pies RW. Depression and the pitfalls of causality: implications for DSM-V. J Affect Disord. 2009 Jul;116(1-2):1-3. Acknowledgments: Thanks to Laura Dunn, MD and Sidney Zisook MD, for suggestions on earlier drafts of this blog; however, the views expressed here are my own. Have you been tearful and sad after the death of a loved one? Did you notice changes in appetite, difficulty sleeping, troubles concentrating, and decreased energy for at least two weeks after the loss? Did you think that was a normal, healthy, and adaptive response to a major loss? Well, if you believe the new DSM-5 criteria approved today by The American Psychiatric Association’s (APA) board of trustees, you would be wrong, as your reaction would now fit the criteria for Major Depression. Under the current DSM-IV criteria, you would have been right, as the bereaved would have not qualified for depression unless symptoms persisted for longer than 2 months or were characterized by marked functional impairment, morbid preoccupation with worthlessness, suicidal ideation, psychotic symptoms, or psychomotor retardation. It made sense to do this as most individuals successfully cope with the loss of a loved one without medical intervention, even though the first few weeks to months following a loss is associated with significant distress. Now there are some persuasive arguments for this change. Probably strongest is that there is little difference between the development of depression from that of bereavement versus other life stressors, such as being diagnosed with advanced cancer or having gone through a marital breakup. In other words, if you have an exclusion for bereavement, shouldn’t you also have an exclusion for other significant losses in life? In addition, grief seen in bereavement is not completely benign. There are a minority of bereaved individuals (approximately 10-20%) in which grief can become complicated and prolonged. For these individuals, complicated grief has been shown to have a significant detrimental impact on their ability to function and quality of life. There are also individuals who truly developed profound depressive episodes shortly after the loss of a loved one. However, the current DSM-IV criteria clearly allows a diagnosis of Major Depression to be made in these instances, although the bar is set higher. bereaved individuals will adjust to a new life without their loved one, but this takes time – certainly longer than 2 weeks. Why will more individuals use Medicare SNF Benefit at the end of life? There will be little incentive to prevent more and more individuals with limited ability to improve with skilled care to move quickly from hospitals to SNFs. It is easier, quicker, and often feels “safer” to send someone to a SNF from a hospital than it is to spend hours on having difficult discussions about a patient’s end of life preferences and goals. And please make no mistake about it, this is a hospital to SNF problem, as SNF’s are the discharge pathway of choice for those at the end of life. John Boscardin, Lynn Flint, and Alex Smith. One in every 11 (9%) decedents died while receiving the SNF benefit. The 1990’s showed a dramatic increase in SNF benefit at the end of life among community dwellers, increasing from 20% to 31%. Since then, things have been somewhat stable in regards to SNF use in the last 6 months of life, hovering in the low 30%’s. Why will the ability to provide high quality palliative care to these individuals be diminished? This one is easy. Most patients enrolled in the SNF benefit are not eligible to receive concurrent hospice care, and furthermore, they likely would not have access to any other form of palliative care. Medicare regulations prohibit dual enrollment in both the SNF benefit and the hospice benefit for the same diagnosis. Occasionally individuals can receive both benefits if the SNF care is for a diagnosis unrelated to the hospice diagnosis, but this is a rarity. It also means that the hospice benefit will likely lose out if someone is considering which one to enroll in, as Medicare will pay for room and board with the SNF Benefit as well as reimburse the nursing home at a higher rate. No such luck with hospice care. only 0.5% of all decedents were enrolled in hospice during their SNF stay, although 9% of decedents died while enrolled in the SNF benefit. What about other forms of palliative care? This study does not address whether these patients were receiving other forms of palliative care, but it is unlikely considering the low penetrance of high quality palliative care into skilled nursing settings. What Will Need to Be Done to Address this Problem? Rethink whether the hospice benefit and the SNF benefit should continue to be mutually exclusive. It’s time to up the ante on the push to get more GeriPal readers on twitter. Today, we have Nancy Lundebjerg (@nlundebjerg), Deputy Executive Vice President and Chief Operating Officer of the American Geriatrics Society, answering some questions on why twitter matters. She also just gave me word that all Reynolds Grantees Attending #DWRF12 can win an iPad by tweeting and successfully answering short daily questions via @theBlueCast (for more info on the game check out AGS’s website here. Widera: In your opinion, why should we get on twitter? Lundebjerg: It’s a very powerful tool for getting the word out about geriatrics and palliative care You can use it to communicate to the world and with each other. Most politicians are on twitter and we have not yet begun to tap the power of including a mention of them in our twitter messages. Widera: Can you give an example of an interesting way twitter can be used in geriatrics or palliative care? Lundebjerg : There are two debates left to go – use it to message about what needs to happen in care for older adults. Lundebjerg: Yes. I use it to bring some personality to the meeting (see Where in the World is Jim Pacala) and to share inspiring statements from speakers with peers who are not in attendance. Lundebjerg: I follow an eclectic bunch of people on twitter – making it a great news feed. I generally pop in about 3-4 times a day to see what is going on. Retweeting something takes a nanosecond and modifying a tweet takes slightly longer. You don’t have to respond to everything nor do you need to read everything. Widera: Do you use twitter to talk about something other than geriatrics or palliative medicine? Lundebjerg: Yes, I’ve used it to get refunds for terrible service. Right now I use it mostly for work but plan to transition to include tweets from my blog or Pinterest. Some people have more than one handle and I’ll probably do that for when I want to tweet about my personal blog or Pinterest. By the by, I am waiting for someone to crack the mystery of Pinterest when it comes to family caregiving. The demographic is exactly right but anything remotely serious seems to go just go thud. Lundebjerg: Following others is a great way to build up a follower base. People will generally follow you back if you follow them. Don’t use the approval process for letting people follow you – it’s pretty easy to weed someone out if they are inappropriate. Start by retweeting and build your original tweet muscle up slowly – it does take practice to get to where you can say something pithy in 140 characters but you will get there. Have fun! Widera: Who do you follow? 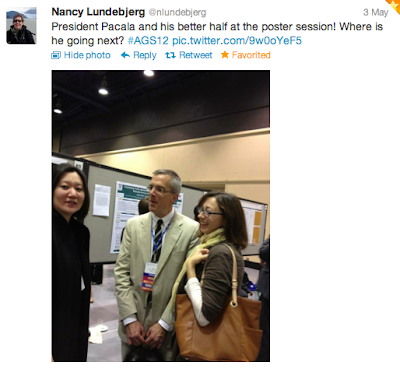 Lundebjerg: I follow you (@ewidera), Ken Covinsky (@geri_doc), Diane Meier (everyone follows Diane!) and am now following any Reynolds attendee (go to @TheBlueCast for a list of those folks). I also follow a bunch of tech folks, the usual suspects in terms of organizations, reporters that cover health and Washington politics, and a number of medical journals. Widera: You keep on mentioning @TheBlueCast. What is it and what are you trying to do with it? Lundebjerg: Our Titter team grappled for a while with what handle to use and decided that because we are running a special contest for Reynolds attendees, we would create a new handle. From there, it was a question of whether we wanted to do something a little mysterious with the potential to go viral (we dream of being Big Bird here at AGS!) and TheBlueCast was born. The interesting thing about the handle is that it could easily be used to illustrate problems with activities of daily living throughout the year so the handle may live on beyond the meeting!